Lisa Pearl is an American teaching English in Japan and the situation there--thanks mostly to her spontaneous, hard-partying ways--has become problematic. Now she's in Seoul, South Korea, with her childhood best-friend Mindy. The young women share a special bond: they are both Korean-born adoptees into white American families. Mindy is in Seoul to track down her birth mom, and wants Lisa to do the same. Trouble is, Lisa isn't convinced she needs to know about her past, much less meet her biological mother. She'd much rather spend time with Harrison, an almost supernaturally handsome local who works for the MotherFinder's agency. When Lisa wakes up inside a palatial mountain compound, the captive of a glamorous, surgically-enhanced blonde named Honey, she soon realizes she is going to learn about her past whether she likes it or not. What happens next only could in one place: North Korea. Alice Stephens was born in Korea and came to the United States as one of the first generation of interracial adoptees. Her work has appeared in Urban Mozaik, Flung, Banana Writers, and the Washington Independent Review of Books, which publishes her monthly column, Alice in Wordland. She has lived and studied on four continents, and the one constant in her life, besides writing, has been travel. 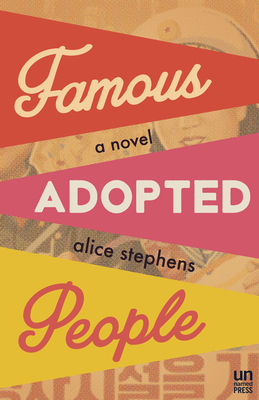 Famous Adopted People is her debut novel. She currently lives in Washington, D.C.